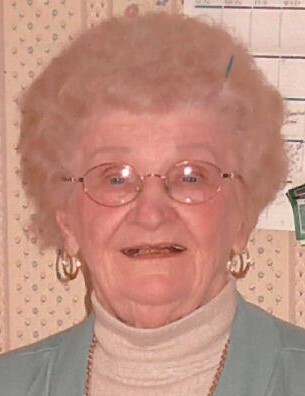 Obituary for Theresa Marge Ferrington | John M. Dobrinick Funeral Home, Inc.
Theresa Marge Ferrington age 96 of Level Green passed away on Friday November 16, 2018 in the Redstone Highlands, Greensburg. Theresa was a member of the St. Regis Church, Trafford, and she worked for the former Westinghouse Printing in Trafford and was a part of the Westmoreland County Election Bureau serving Level Green for 15 years. She cherished her grandchildren and great-grandchildren and loved being involved with them. Theresa was preceded in death by her husband William L. Ferrington; siblings Peter Laytos, Veronica Weber Dorothy Galonis, and her twin Margaret Hags. She is survived by her children William Ferrington (Karen) of Greensburg, Darlene Erney (Charles) of New Alexandria, and Denise McDonald (Kevin) of Irwin; 9 grandchildren; 15 great-grandchildren; her sister Rose Jimcosky of Scranton; and numerous nieces and nephews. Family and friends will be received on Tuesday from 2-6 PM in the John M. Dobrinick Funeral Home Inc., 702 7th Street (State Rt. 130) Trafford 412-372-3111. Private funeral services and entombment will be in the Twin Valley Memorial Park Mausoleum, Delmont. In lieu of flowers memorial donations can be made to a charity of one’s choice in Theresa’s name. www.dobrinickfhinc.com.